Chocolate Almond Truffles are a treat that very few people will pass up if given the opportunity. I certainly would put my hand up - or out, as the case may be! You can indulge your own taste-buds or act as a "fairy truffle godmother" to some of your friends or family. Take advantage of this delightful little creation that will make your eyes close, your mouth dance, your lips smile, and your heart sigh in ecstasy. Order scrumptious truffles from some of the finest chocolatiers if you really want to indulge in the gourmet. My best recommendation for chocolate truffles is without doubt zChocolat.com. But, truth be told, I also have a soft spot for Dan's Chocolate because you can get some really good quality chocolate truffles at an affordable price. Here are a few more options for your delectation, but if you want to make your own chocolate almond truffles there are recipes below. There is no reason why you can't make your own scrumptious truffles with these simple recipes. They are absolutely wonderful and not as hard to make as you might imagine. Give them a try and discover for yourself their delights. Melt chocolate chips in double boiler, stirring until smooth. Add butter and powdered sugar, stirring until completely dissolved. Remove from heat and add egg yolks one at a time, beating after each. Cover and let set at room temperature for 12 hours. Form into 1 inch balls placing a whole almond in the center of each. Roll in chopped almonds and serve. If you have any leftovers (impossible! ), store in airtight container between layers of waxed paper and refrigerate or freeze. Place 1 pound of chocolate in large mixing bowl. Bring cream to the boil in saucepan over medium heat. Pour cream over chocolate and let stand for 1 minute. Stir or mix until well blended. Add 3/4 cup of the almonds and blend well. Cover and allow to set overnight at room temperature or 3-4 hours in the refrigerator. Using your hands, a melon-baller, teaspoon, or pastry bag, form 1" balls. Place on waxed paper covered tray and chill until firm. Roll balls in cocoa powder and chill again. Prepare remaining chocolate for coating by tempering it. Dip the balls in the tempered chocolate and place on waxed paper covered tray. Sprinkle with remaining almonds before set. Allow to set until firm or chill for 10-15 minutes. Store in well wrapped airtight container in refrigerator or freezer. Serve at room temperature. Makes about 60. Instead of dipping the truffles in tempered chocolate, roll them in a small bowl of cocoa powder, powdered sugar, or finely chopped, toasted almonds as soon as they are rolled into balls. 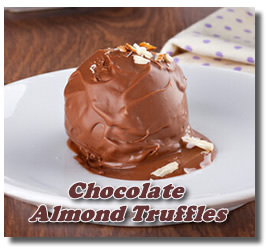 Any nuts can be substituted for the almonds, both inside and outside the truffles.